Mind you, annual reviews are not altogether a bad idea. Compiling information to share with stakeholders – in our case the Governor and their staff, Arizona’s Office of Strategic Planning & Budgeting, Joint Legislative Budget Committee, the public, industry and business – has merit. Unfortunately, it sometimes seems that the only readers of annual reviews are the writers, graphic artists and staff that draft the report. 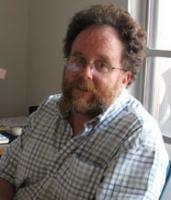 Former AZGS Director Larry Fellows issued the Survey’s first formal annual report (referred to as an "Activities Summary") in 1983. In 1985, the report was renamed the "Annual Report" and we have been publishing them since. In 2014, we revisited our approach to reporting, and stumbled off in a somewhat different direction; a direction we hope will be more pleasing and engaging for a broader audience. This new approach yields a better sense of the people and projects that drive the AZGS. Each member of our professional staff contributes a 1-page article, complete with graphic, outlining their role and accomplishments at the survey. This approach is not without hurdles; our staff members are universally modest and prefer the shadows to the limelight – or so they would have us believe. Nevertheless, a judicious measure of caterwauling, whining and begging yielded a 55 page document soon to be released as "Arizona Geological Survey Annual Report Fiscal Year 2015." 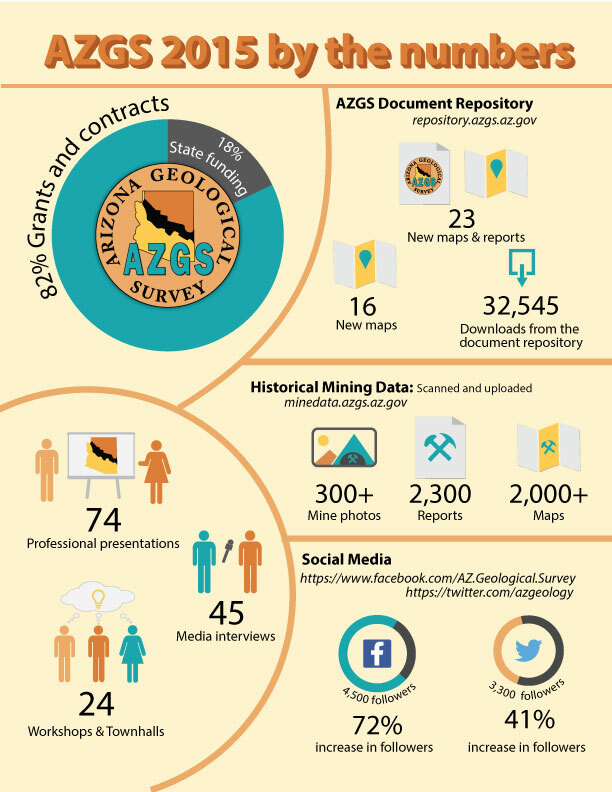 One of the highlights of this year’s report is our first "AZGS By the numbers" infographic, designed by graphic artist, videographer and editor Stephanie Mar (INFO GRAPHIC thumbnail to pop up). EarthCube – blazing a cyberinfrastructure trail for the global science community. There are another dozen or so articles that range broadly from mapping in the Santa Rita Mountains, to AZGS web communications – including social media – the further adventures of the virtual Arizona Experience, a new look for the Arizona Experience Store, and where the monies come from. 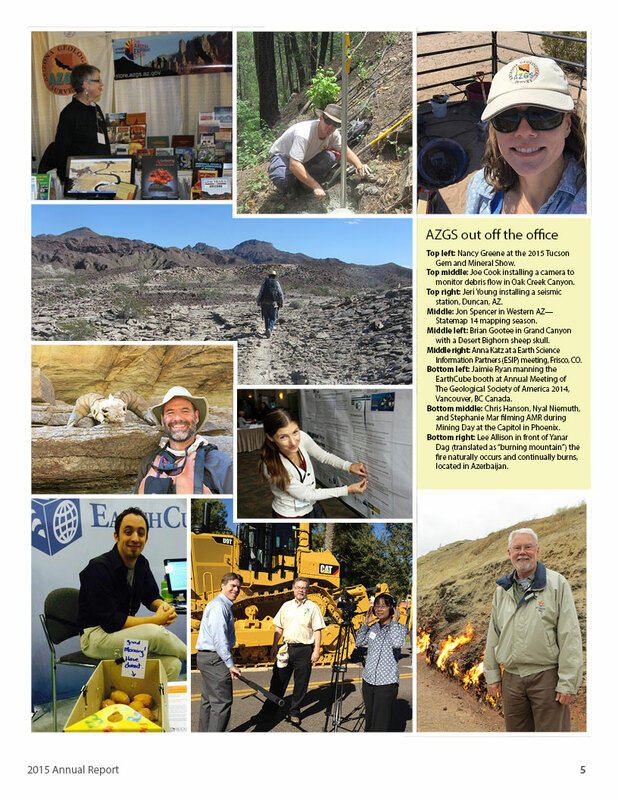 The Annual Report also includes an exhaustive list of publications, presentations, events, workshops and field trips. 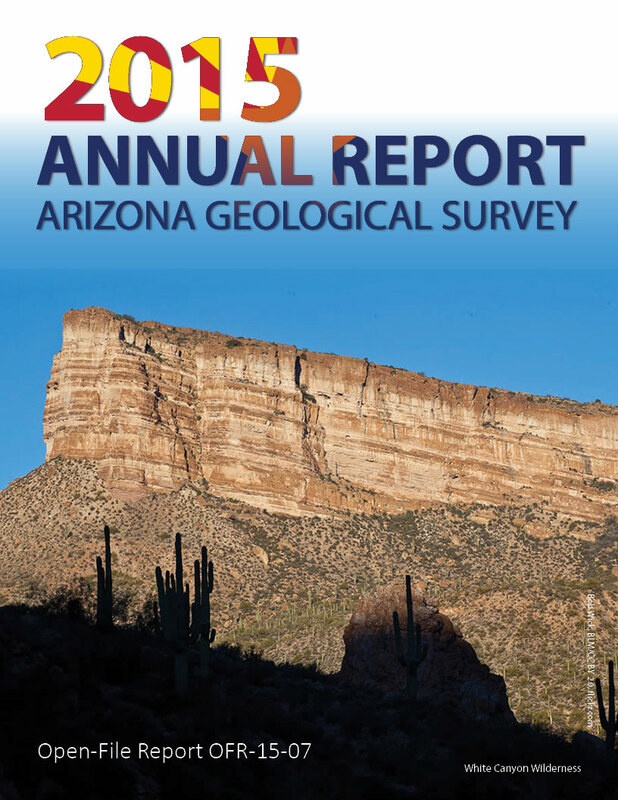 Release of the Arizona Geological Survey 2015 Annual Review is pending.